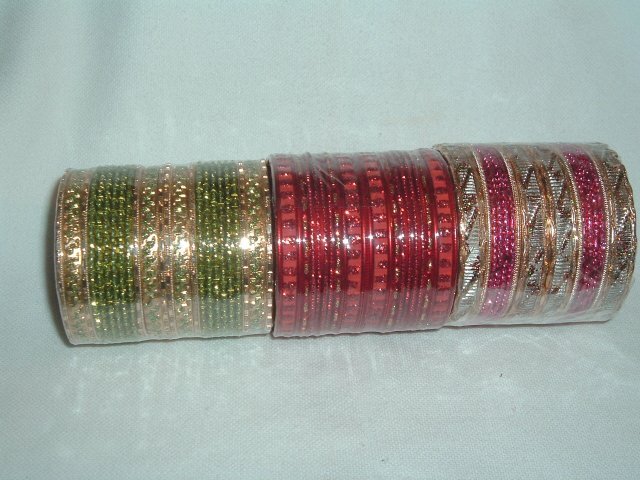 Set of one dozen colored metal bangles, 4 with self design & 8 with gold glitter and design on them. Available in different colors and sizes. Clothing with any kind of work should be dry cleaned. Cotton clothes may be hand washed or machine washed separately. Color may bleed in the first couple of washes. Can't find a size? Click here to search for the size you are looking for. Free Shipping within USA on orders over $75.00. Use Coupon DVSH75. Add this product to your shopping cart to view shipping estimate. Tell a friend about this product. Read what some of our online customers are saying! Thank you so much. Again, I want to let you know the saree is beautiful. My daughter loves it. Copyright © 2004 - 2014 Acro International Inc.